and all the old folk kept complaining that we was being robbed as a result. Of course old pennies were worth something in those days. Being born in the eighties I have learnt some of these but there were many I didn't know. You say Bob but that is slang for shilling just to confuse things. Why was there an amount called 'dollar' when it's pounds sterling? Why a 'tanner' which sounds far too similar to the much much greater amount of a 'tenner'? My dad said some of the more posh and expensive shops used to just display the price without saying if it was in pounds or guineas. Apparently if you had to ask you couldn't afford it. Don't know if there's any truth in that? I believe a silver dollar or silver crown (5 bob/shillings) were a similar value in silver at some point. Just did a quick search and ... The V.A. miuseum refers to the medallist John Sigismund Tanner (d. 1775) origin German; came to England in 1728, soon after was appointed as an engraver at the Royal Mint. Became Chief Engraver in 1741. Apparently the sixpence he designed for George II popularly gained his name". Never knew that. The one thing you have to remember about these coins was to work in the duo-decimal system so even the lowest of the low shop assistant had to be pretty numerate. If you had to add say 5 items at 7s4d & 3 farthing together you really had to have your wits about you. The Churchill crown is a super bit of history (he would have sorted Brexit); but I don't think there was any silver in general circulation coinage post 1947. Thanks for your knowledge. Very interesting how coins have changed. It’s funny I got more interested looking and researching these cheap old coins then I do with modern coins. Today I received this set. I don’t think it’s worth anything. Thank god im not old enough to remember them. Anyone got any information about them. Am I sitting on a super rare coin? Nice! The shillings need switching around though (single lion is the Scottish version). And to think my Nan used to complain that the new decimal system was confusing! I’m not looking to make money but I can’t believe these sets are so cheap I think I will buy some that are in better condition than mine. I just like them. My mother used to call the half-crown a half- Dollar. That's when you used to get 4 Dollars to the £1. Couple of RABBITS Coinsters !!!!!!!!!!!! 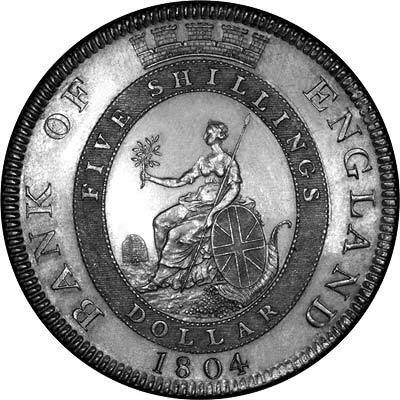 One of my favourite coins (that I don't own) is the 1804 5 shilling Bank of England token. It has a legend on one side saying Five Shillings : Dollar. Picture borrowed from Chards. And a BREXIT SILVER COIN Coinsters !!!!!!!! Is this a rare date (29th March) error coin? What a classy looking "coin" - (I guess it has a legal value); although Britannia has certainly improved her looks recently - she looks a bit worn out here which I can only put down to the French who were up to their usual tricks at the time. Today my silver Brexit themed medal from @SilverStan arrived. Great piece of work. A deal too hard to pass up. 1820 Sovereign (needs some NCS lovin' ) - love this design, to match the 2017 which is my fav coin. And then this one is a bit of a random by - my son was sitting with me while i was bidding on some lots and said "buy that one" so i bid and won it... its a T.D.C 2012 Sov with a "satin finish" - mintage 100. However under a loupe with a light it has a fantastic sparkly finish and lovely detail... just hard to see normally. My first, and definitely not going to be my last, purchase from @arshimo2012..Many thanks Sir! Please welcome an arrival from Australia... a rare 1862 Sydney Mint half sovereign. She may have a tarnished background... but is still a pleasure to behold! And from the UK, a superb example (MS61) of the 1867 full sovereign from the Sydney Mint which brings out the beauty of the Australian Victorian head type.